My Tony Fleecs 1-a-day sketch cards came in! 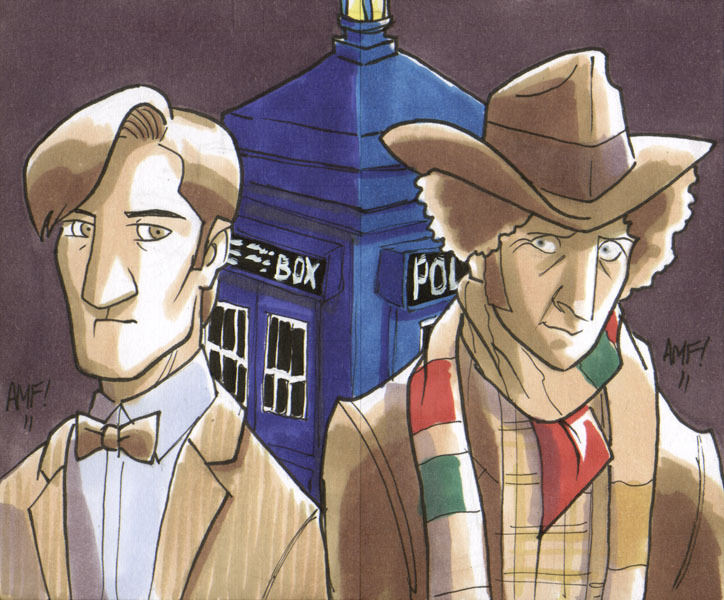 I requested "any two incarnations of Doctor Who you like," so I got this cool diptych of the Matt Smith and Tom Baker Doctors, which is cool because I had yet to get solo sketches of either. What's really cool about this for an over-the-top Whovian like me, though it comes across better in the actual art than in this scan, is that the respective Doctors' TARDISes are differing shades of blue, just as their actual TARDIS props were/are on the show (Baker's being much a much lighter shade than Smith's). Thanks, Tony! Also appreciated were the Anakin Skywalker and Ahsoka Tano card I commissioned for my son, which will be the subject of a future Pretty Sketchy post.